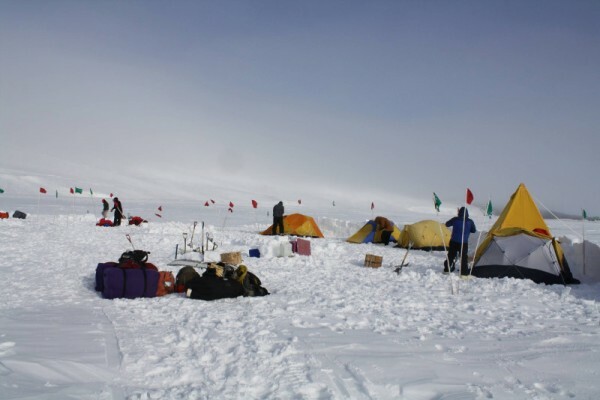 Scientists from Lamont-Doherty and Indiana University-Purdue are camping by the Transantarctic Mountains, studying exposed rocks near the edge of the Antarctic ice sheet for clues to how the ice shifted in the past. They hope the geological record will help us understand the effects of a warming planet today. Mike Kaplan, Kathy Licht and others report from the field, and answer readers'‚ questions, with help from Gisela Winckler at Lamont. We decide today is the last day for our camp, and we pack up and drive back to our base camp, the Central Transantarctic Mountain camp (CTAM). A sadness in a way, because it was our cozy home for a week. We ate, slept, and joked around here night after night. Also, we realize that packing up camp represents the end of the field season, except for one more day. For the last day of work we will fly by helicopter to the Achernar area from the CTAM camp. The last day at Mount Achernar. We use the helicopter to go near the southernmost part of the area, near the Lewis ice tongue, which comes off the East Antarctic ice sheet. After a long day, we collect our last samples, and wait for the helo to pick us up – the end of the field work for this season. We realize we had a very successful field season. Not one day of work was lost at either Mt Howe or Mt Achernar (a very rare experience for Antarctica). We think about how we accomplished our goals in terms of getting to both remote sites and collecting samples. 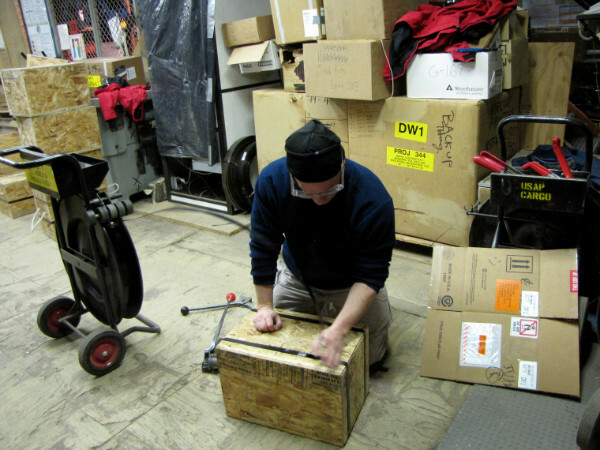 Back at CTAM camp, we scramble to get all our stuff packed up ready to be shipped back to McMurdo. They are closing the CTAM camp for scientific work in a week because they need to take everything down by the middle of February. The middle of February represents the end of the field work for everyone in Antarctica. It starts to get too cold, and the sun starts setting in some areas farther north. People start to go home then and McMurdo gets ready for the winter. 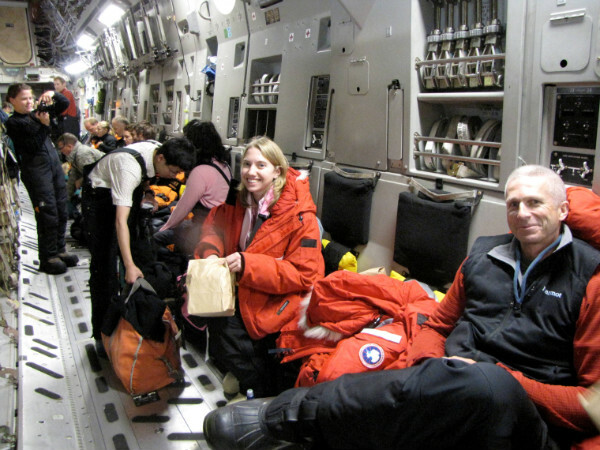 We all fly back to McMurdo. A bed and running toilets (!) for the first time since we left for our camping trips. Also, the dorms have dark curtains that go over the windows. So, darkness, a bed, and a toilet – who would have known life can get so good! We set out on the snowmobiles with all the sleds to Mount Achernar with all our stuff. 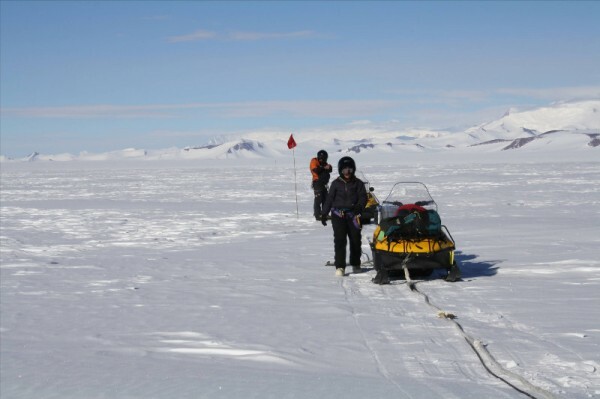 After about three hours we reach the site (crossing the flagged crevasse zone with no problem). We are joined by a fifth team member, Tim Flood, a Professor at St. Norbert College in Wisconsin. Tim has expertise in petrology or rock composition. So, we will have one additional person for the Achernar part of the trip. At first we only find ‘blue ice’ to set up camp. Blue ice gets its name mainly because – in contrast to the typical situation of having a layer of snow on top of the ice sheet – there is only ice. The snow layer that normally covers the top of the ice sheet is blown away where the winds blow pretty fast and consistently. This means there is no good place for camp right in the Achernar area because all the blue ice is a sign of strong winds. We decide to back up a few miles to where the snow starts again and camp a little but away from Mount Achernar. This means we will have a ‘daily commute’ to get to where we want to work, but at least we have a nice place to live for the week. It is less windy where we decide to set up camp and a nice layer of snow in which to pitch the tents and walk around. Blue ice is very difficult to walk on – it is just what it sounds like – walking on ice! We set up camp. Unlike at Mount Howe, here each person will have their own tent. 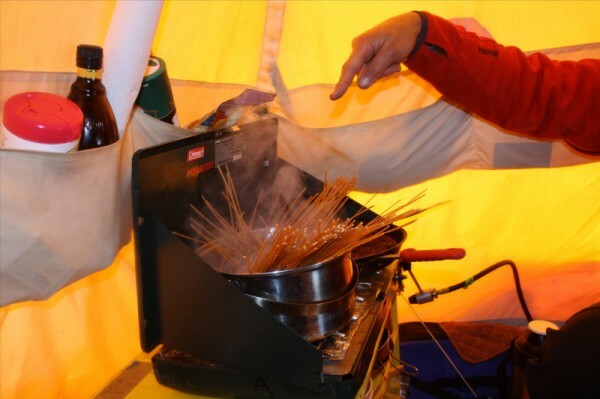 In addition, we set up the bathroom tent and a huge kitchen tent, named the ‘Arctic oven.’ The arctic oven will act as a kitchen and dining area. It is about 25 feet long, enough to be comfortable. And, when we have two stoves going inside, the temperature gets up to a comfortable 60 degrees or even higher (hence, its name); comfortable enough to start peeling off all our jackets while eating. Two little speakers that Tim picked up in an airport, attached to ipods, means we even have a stereo system in the arctic oven cook tent. The first day we drive out to where we want to work. It takes about an hour and a half each way by snowmobile. This is quite a bit of time. In addition, the glacier deposits we want to study are much larger in area compared to at our first site at Mount Howe. It is not practical for us to drive everywhere and get to all the places by walking. We realize we will need to utilize the helicopter from nearby CTAM. So, the next week or so we alternate: a “snowmobile day” when we commute by snowmobile from camp to the field site and “helo days”. On the helo days, the helicopter flies out to our camp (a short flight by helicopter from the CTAM camp) picks us up, takes us exactly where we want to go around Mount Achernar, and then at the end of the day, comes back out to bring us back to our camp. All these trips only take the helicopter folks about 75 minutes in total each day, given how fast they go. Collecting samples from the top of boulders that got left back by the retreating glaciers. 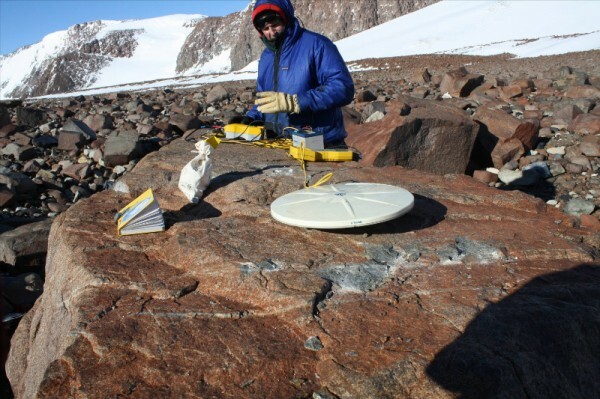 At home in the lab at Lamont, we will use a method called 'Surface Exposure Dating' to figure out when the ice sheet left these boulders behind when it retreated. 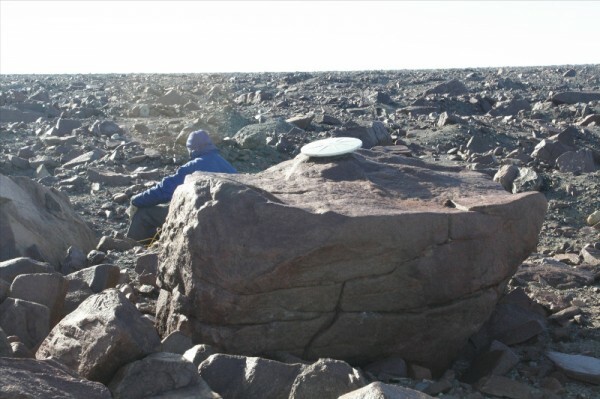 We spend the next 8 days or so doing the same sort of work as at our first site Mount Howe. We map the glacier deposits (how red or oxidized are they – how do their elevations changes? How do the deposits themselves change in terms of shape and composition and other characteristics?). Mike K and Mike R (with occasional assistance from others) collect samples for the surface exposure dating, so they can eventually figure out how old all the deposits are. Kathy, Nicole and Tim study the composition and types of glacier rocks and sediments left behind. Similar to our finding at Mt Howe, we find pronounced changes in the glacier moraine deposits around Mt Achernar. This indicates there are likely deposits of different ages, left behind at different times by the ice sheet when it was bigger. All the team members continue to collect samples that will be analyzed later in the lab. We are back at the CTAM (Central Trans Antarctic Mountain) camp. Over the last several days we take stock in that we accomplished the first major goal of our trip. 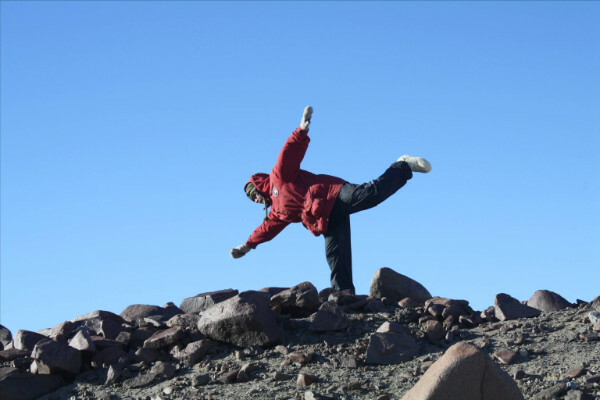 That is, to study the glacier deposits at Mount Howe, the southernmost rock outcrop on Earth. 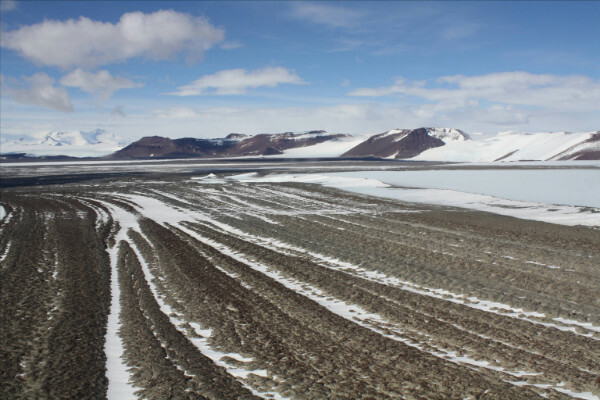 We found (what we think are) deposits left behind by the ice sheet when it was bigger, at several different time periods in recent Earth’s history. We can tell in a preliminary way, before we have carried out the laboratory work back home, that the glacier deposits must be of different ages because they are different ‘colors’ – red for more oxidized (rusted). They also show other signs of varying in age such as the weathering of the rocks and landforms, which increases away from the ice sheet (=older). 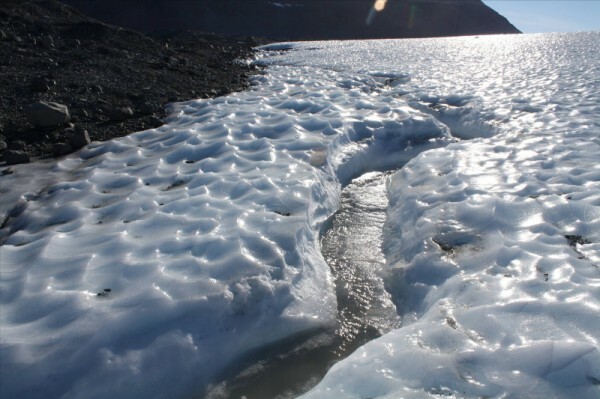 This means that there will be a record of the glacier leaving behind different types of rocks over a period of time, likely well before the last ice age. It was an important goal to find such deposits for our sampling. We quickly regroup our stuff over the next few days at the CTAM camp and start to get ready for the next major camp move, to Mount Achernar. For this stage of our trip, which is only about 25 kilometers from the CTAM camp, we are hoping to get there by snowmobile. We will use 4 snowmobiles pulling 6 sleds (two snowmobiles will pull two sleds each). This will allow us to move our entire camp, set it up for more than a week near the site, work, and then come back to CTAM after 8 days or so. However, there is a small problem. There is a crevasse shear zone in the ice sheet between the CTAM camp and Mount Achernar. So, we must figure out where to cross the crevasse zone. We do this two ways. First, we take a helicopter trip from CTAM for an hour (they are quick) to scope out or reconnaissance the area (a “reconn”). On the helicopter, we think we figure out where we might be able to cross the crevasse zone. The helicopter trip also allows us to see the whole area of Mt Achernar and where we want to camp. Camp ideally has to be on a snow patch so we can stake the tents down and in a spot not too windy. The second way we figure out how to cross the crevasse zone is to go to it, by snowmobile on just a day trip from CTAM (another “reconn”). Mike R (Roberts), our mountain guide, shows us how to link the snowmobiles by ropes, in case one falls into a crevasse. We also put on climbing harnesses and rope ourselves to a second set of ropes between the snowmobiles. This is so that if we fall in, we can either climb out or be pulled out by others. We get to the crevasse zone which starts at about 15 miles from the CTAM camp. The first few crevasses seem quite bad – each about 2 to 5 feet cross. Although they all seem to have natural ‘snow bridges’ that cross the top of the crevasse, which we can drive across, we need to be confident that they will not collapse due to the weight of the machine. Mike R slowly investigates each crevasse we cross to see how strong the overlying snow bridges are and how wide each crevasse is. After about an hour, we start thinking maybe there are just too many crevasses (every few hundred feet we are finding another one) and it would take too long to figure out how to get across the entire crevasse zone. Mike R suggests we park and get off the snowmobiles, link up with ropes and slowly walk for a while to see how much longer the bad crevasses continue. This seems easier at the moment then stopping and starting the snowmobiles every time we reach another crevasse. To our surprise, the crevasses quickly get smaller and disappear just as we start walking! We did it ! We found a reasonable and quick way to get across the crevasse zone which is less than a 1 mile wide at its bad part. We put flags next to each one so that we can easily see where they are when we come back through on the way to Mount Achernar site to do our work. The first day of geologic work at our Mt Howe field camp. We start walking on the moraines (piles of debris left by a glacier, just like around NY, Indiana, Wisconsin, where we are from) and we have to put on crampons. These are spikes that go on the bottom of our boots. This is because the moraines are really hummocky to walk on and right under just a few inches of dirt is ice, making us slip and slide and do more leg splits than we can remember! But, we quickly identify roughly where we think the ice was during the last ice age. We can do this because the deposits are ‘grey’ in color as they do not have time to oxidize (like rust on a car). The stuff left behind by older ice ages is red in color – because it has had time to oxidize. We start collecting our first samples. Kathy and Nicole collect material to figure out the type and chemistry of the glacier deposits left behind, which will help tell them which way the ice must have been moving in the past and what kind of rocks it brought up from below. Mike K and Mike R start measuring the elevations of all the glacial deposits and more important start collecting samples from the tops of large boulders. These samples will help us figure out the time at which they were left behind. Once back home, we will use a method called cosmogenic surface exposure dating. We will use our lab facilities at Lamont-Doherty Earth Obsservatory to date the rocks, using the cosmogenic nuclides Beryllium-10 as well as Helium-3. Over the next 6 days or so, both teams just systematically collect samples from each set of ridges or moraines that the ice sheet left behind in the past. The idea is that each distinct moraine ridge represents a different time period or glacial period when the ice sheet was bigger. The weather holds up well, an important fact when you are only a couple hundred miles from the South Pole. The temperature remains about -10 to 0 during the day. Anytime the wind picks up thought, the wind chills causes it to get colder fast. Often exposed skin has to be covered quickly. Only a few days are cloudy, otherwise the sun adds a little bit more warmth. Fortunately, the tents are warmer, especially when we run the coleman stoves. So, eating dinner is way more comfortable than being outside. 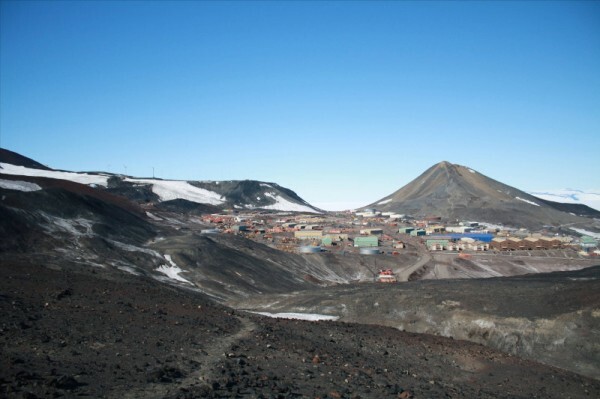 We fly from McMurdo to our first base camp, named CTAM, which stands for Central Transantarctic Mountains. This camp is set up by the US National Science Foundation every 5 to 10 years, with input from scientists on the cutting edge research that can be done in the region where it is set up. 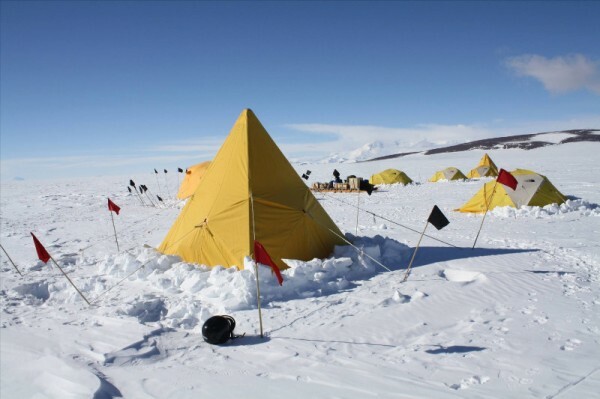 An idea for having the camp is to make central Antarctica more accessible every once in awhile to scientists who want to carry out research in remote parts of the continent, such as our team. 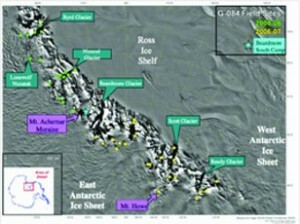 Otherwise, many of these areas are too hard to get to from the larger more permanent bases and camps such as McMurdo. Here we will gather all our things, organize our gear for the final time, and then go to our remote ‘deep’ field sites to work. 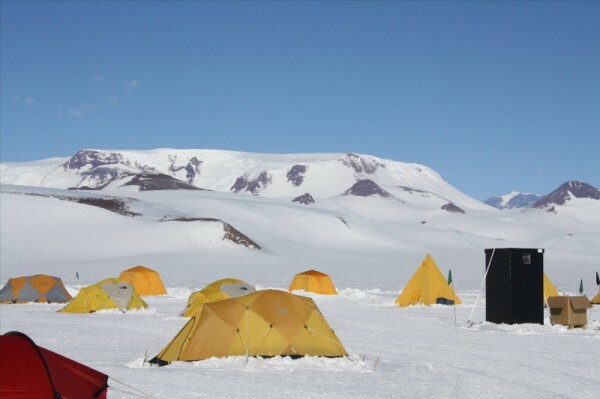 This is the third largest camp on the Antarctic continent this season, and is helping various science teams carry out research, such as in biology and on fossils, geology, and on the ice sheet (for example, how it flows). 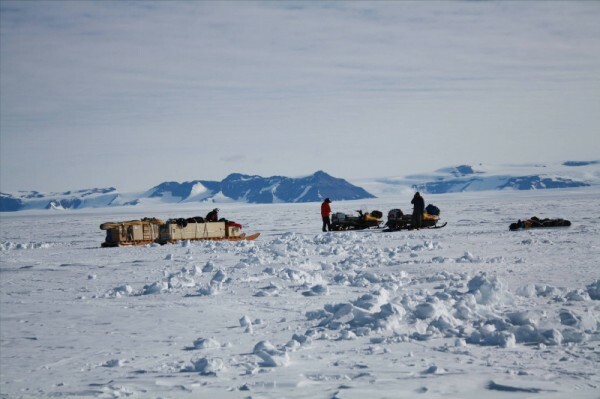 The camp allows teams such as ours to reach by helicopter and twin otter plane more remote locations this year in central Antarctica, which is normally very difficult. First, Kathy and Mike R fly to the first of our major camps, at Mount Howe. The next day, Mike K and Nicole fly. 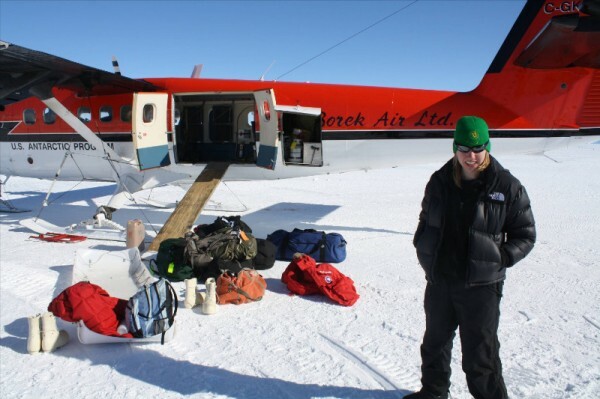 We use a twin otter plane to take all of our gear, including a snow mobile, and only two people can go at a time. The trip takes about two hours each way. This is the first time Mike K and Nicole really get to see Antarctica. The flight is one of those unique experiences of a lifetime as we fly over the mountains high enough to poke through the Antarctic ice sheet. Upon arriving, camp is set up (fortunately Mike and Kathy get much of this done the first day), including two three Scott tents and a mountain tent. One Scott tent is our bathroom – one of the most important tents to go up! Mike K’s tent will act as a dining room and kitchen. Using a GPS, we figure out the South Pole is only 184 miles from our camp. Less than 3 hours if we are driving on an interstate in the US. We survived Happy Camper survival school! 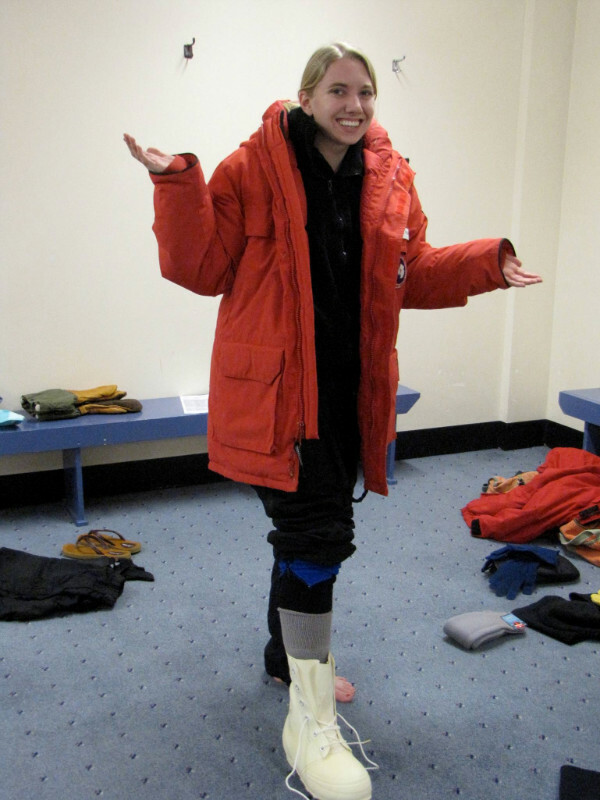 This is essential training for anyone who goes into the field on the coldest most remote continent on Earth. Kathy took hers 4 years ago. We learn to build snow trenches for survival and all things related to camping in the cold, although we still appreciate that it is warmer here than back home (in the 30s, dry and sunny). 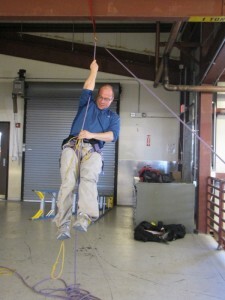 Also, everyone goes through snowmobile basic repair and use, rock climbing 101, and crevasse rescue training. 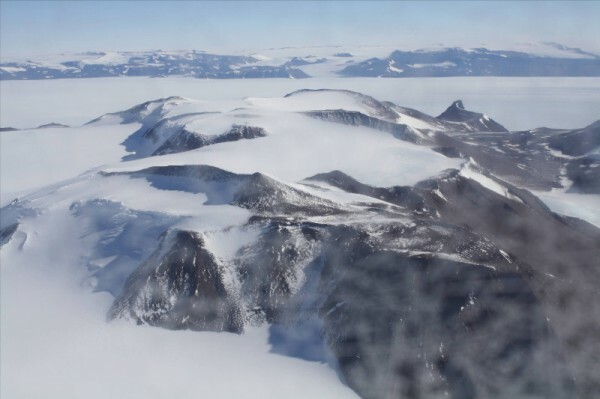 Tomorrow is the last day before flying out to the remote CTAM (central Transantarctic Mountains) camp that we will use a base for getting to Mt Howe and Mt Achernar. Mike Roberts, our mountaineering guide, uses the last day to give one more crevasse-rescue training course. We learned how to stop a fall down a steep slope, set up rescue systems and traversed around an ice fall to learn to recognize and avoid crevasses. Upon our return, we found out that our flight will be delayed a day. Very typical for Antarctica! It’s great to be back on this amazing continent. I certainly never tire of the beauty of this place. Well, I wouldn’t call McMurdo a beautiful place, but it is buzzing with activity and provides great support for the scientists. Things are much the same here as 4 years ago when I was last on the ice. Dozens of science groups work out of McMurdo station, which acts as a hub of activity for a wide range of scientists, including geologists, biologists, glaciologists and atmospheric scientists. 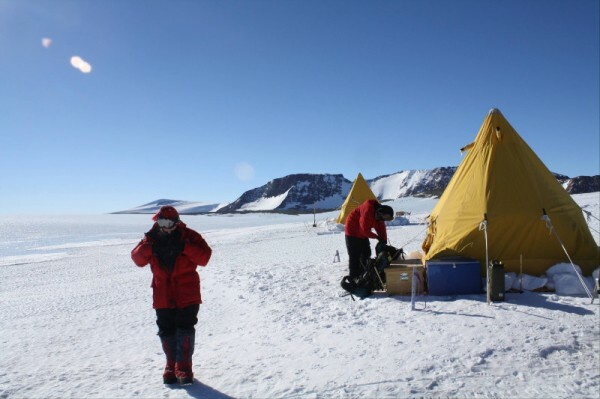 Many groups, like ours, utilize McMurdo as a place to organize field gear for camping trips to distant sites on the continent to collect samples. 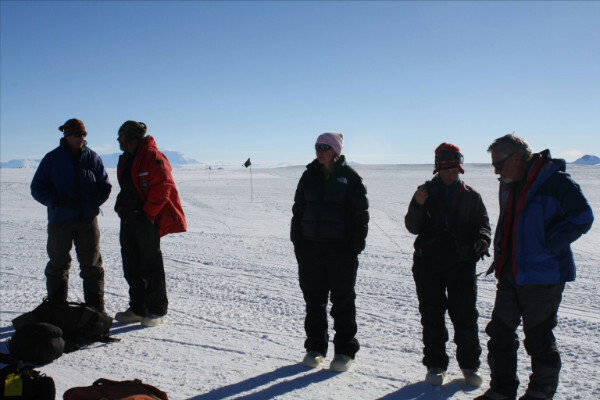 Others groups stay in McMurdo to conduct experiments on samples collected nearby. All the science groups have small offices and some work on high tech equipment here in the Crary Lab. This is an amazing resource, particularly in terms of support staff who really work hard to help us out. An exciting new addition to the local scenery is the small group of windmills erected to generate power for this energy hungry place. My understanding is that this effort was led by the New Zealanders, whose base (Scott Base) in only about a mile away. 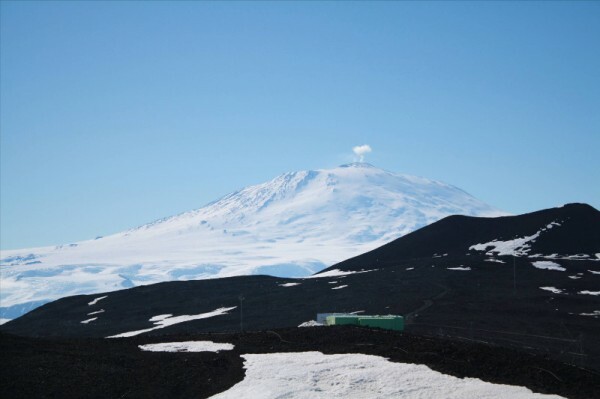 Luckily, the international cooperation between the NZ and US Antarctic programs means that McMurdo is benefitting from this great ‘green’ experiment in power generation. 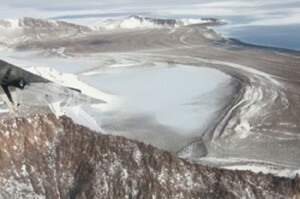 McMurdo station rests on the South West tip of Ross Island, which is dominated by the active volcano, Mt. Erebus. As a current resident of the rather flat state of Indiana, I take pleasure in temporarily living on the flanks of a volcano rising more than 12,000 ft above sea level, with its nearly perpetual puff of smoke at the summit. We left Christchurch in the rain – the last we will see for awhile! 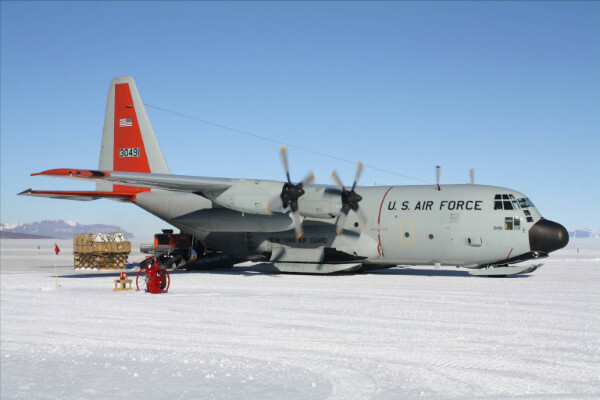 After a 5 hour flight on a US air force plane, we land on the McMurdo Ice Shelf. We get off the plane in Antarctica – and – it is beautiful – in the 30s (Fahrenheit) sunny and dry. When it is this dry and sunny, it is light jacket weather. Some people are working around in short sleeves and fleeces. Just like the weather in New York (as family tells me on email the next day), and significantly warmer than the weather in Wisconsin (where Nicole came from). This is Mike Kaplan and Nicole’s first time here, but Mike Roberts and Kathy have been here before. The planes land on snow, which is groomed with a special compacting machine so that a normal plane can land and take off on the snow. The next 10 days are for packing, coordinating, and most important, taking safety classes of all types, including the most important – happy camper. Nicole and Mike need to do a two day/1 night class where we camp outside, learn about all the camping equipment, and show we can deal with the elements, before they send us out into the unknown. We also need snow mobile school, helicopter safety school, environmental safety and awareness, crevasse training, and on and on…With all the gear and packing to put together, including food, this will take well over a week before we can even think of leaving McMurdo and heading out to the next stage and field work. Most of our time is getting our gear together, making wood ‘rock boxes’ (see photo) for storing our geologic samples after we collect them, choosing our tents, food, and other things we are taking. We need to make sure we have two of many things, such as stoves, for safety. Just planning our food for when we are working takes all afternoon and half the evening. 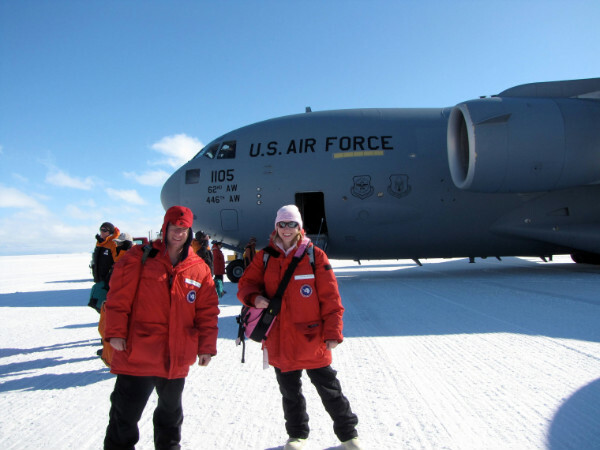 Mike K and Nicole are also starting to learn their way around McMurdo Sound, which is a really interesting place. It is like a small town with a library, general store, three gyms, a coffee shop and wine bar. We all room in dormitories like we are students again. Of course, Kathy and Mike R are old hats here. McMurdo is the base for the United States Antarctic Program (USAP). During out time here, we can see planes and helicopters coming and going, as they take supplies and scientists to various places, including the South Pole. We all eat in one big cafeteria for everyone, buffet style. Fortunately, for Mike K, they are two ice cream machines, in case one breaks down! After months of waiting, we leave Los Angeles on a non stop 12 hour flight to New Zealand. We ‘are’ Mike Kaplan at Lamont Doherty, Kathy Licht a professor at Indiana University-Purdue University Indianapolis, and Nicole Bader a student from St. Norbert College in Wisconsin. Nicole is finishing her undergraduate at St. Norbert but will be doing her Master’s thesis research with Kathy starting in the fall. Her project will focus on what we do in Antarctica. It is hot and humid when we landed in Auckland. We went through customs and had the customary 15 minute walk to the domestic terminal. We noticed the heat and humidity not just because we just came from the ‘winter’ in the United States, but we are soon to go to the coldest part of the planet. We stayed in Christchurch a day. This is to get our gear at the CDC (clothing distribution center). All the extreme cold weather clothing is issued here. We try things on, ask for more (and more!) clothing, and pack everything for our trip. We wait, and walk around Christchurch, including their beautiful Botanical Gardens, have a great Thai meal – knowing thesis will be the last of such sights and greenery (and hay fever!) we will see for a month. We also meet Mike Roberts here, a New Zealander originally, who is our mountaineering guide and new companion. He will be an integral part of our field season and our team and we are happy to meet him finally. A major factor in predicting future climate change and its impact on the planet is the response of the Earth’s ice sheets to warming temperatures. Understanding the historical context and dynamics of Antarctica’s massive ice sheets is critical for modeling future changes that have the potential to impact the globe, including significant contributions to sea level rise. Satellite image of the study region at the edge of the Transantarctic mountains. Click to enlarge the image. Michael Kaplan and Gisela Winckler, two climate scientists from Columbia University’s Lamont-Doherty Earth Observatory, along with Kathy Licht and Jeff Swope from Indiana University-Purdue University Indianapolis, have recently started a new project, funded by the National Science Foundation, to study the timing and extent of advances of the East Antarctic ice sheet in the past. 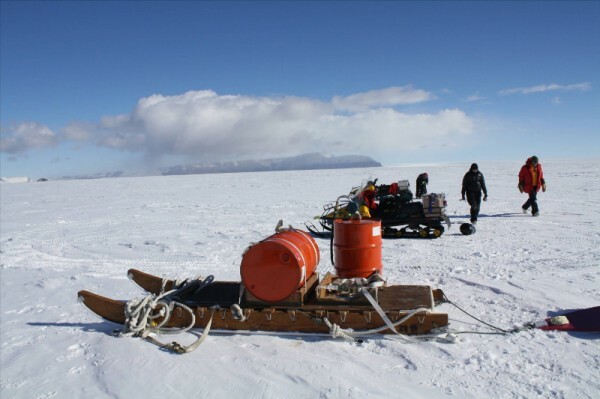 Integrating field work, geochemical analyses and cutting-edge isotope-based dating tools will allow the scientists to develop a record of fluctuations in the East Antarctic ice sheet and to identify past changes in both ice sheet flow direction and bedrock composition. 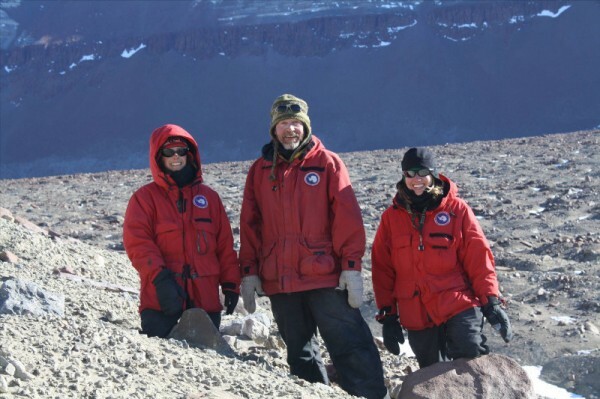 On December 13th, Kathy Licht and Mike Kaplan, along with Tim Flood and undergraduate Nicole Bader, both from St. Norbert College, left for their exciting trip to the East Antarctic plateau to collect samples to address these research objectives. Their route will take them via Christchurch, New Zealand, to the Antarctic station McMurdo and on to the East Antarctic ice sheet. It will take them about two weeks to get to the field site. Aerial photograph of Mt. Howe taken from the window of a Twin Otter. Photo by K. Licht. Accompanied by mountaineer Mike Roberts, they will work from two remote field camps at the edge of the Transantarctic Mountains. The satellite image shows the study region with the major outlet glaciers from East Antarctica crossing the Transantarctic Mountains and flowing northeastward into the Ross Ice Shelf and West Antarctic Ice Sheet. The sites noted in purple will be the location of the two small field camps where the group will be collecting samples. The blue star shows the location of a large field camp, which will be the jumping off point for transport to the smaller camps. The green and yellow dots show the locations of samples collected during two previous expeditions to the region. 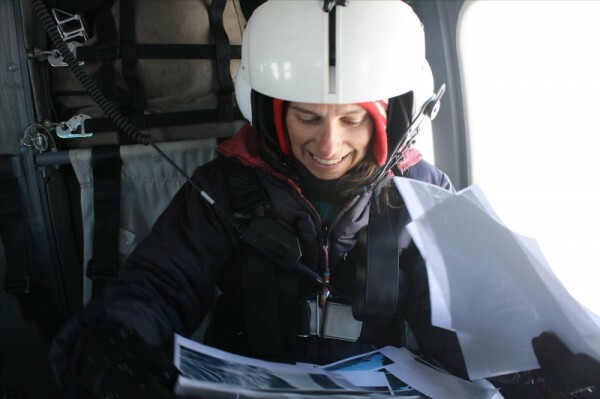 Over the course of a month, the team will sample boulders and glacial sediments that have accumulated on the ice sheet surface over thousands of years. Kathy and Mike will report from their adventurous trip on this blog while I will facilitate communication with the field camp and answer questions about the laboratory side of the project. If you have any questions or comments, please feel free to ask. I will field questions and send them over to Antarctica from where Kathy and Mike will, whenever possible, send back answers.